Mould appears in your home due to condensation or high humidity. Since the exterior walls are cold and the inside of your home is warm, you will end up with mould if you don’t control the humidity level. As you can imagine, mould in your home can be very problematic. The mould spores are multiplying fast, and this can lead to respiratory problems, not to mention it will damage your home decor. So, how can you stop mould from growing in your home? Ideally, you need to mop up all the standing water from spills as fast as possible. Otherwise, mould will grow in the next 1-2 days. Yes, it grows fast, so you have to address this problem as fast as possible if you want to have the best possible result. It’s normal to have condensation on the cold surfaces of your home. To help with this, you should lag all the pipes with some pipe insulation. Put a jacket around the water cylinder and tank unless you have a combi boiler. Check you have no drafts around your windows and doors. Check and top up if required the insulation in your loft. Insulating your home brings you benefits in the winter as well as summer. 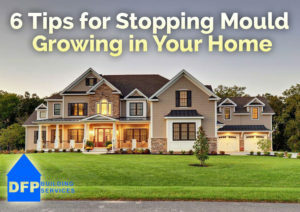 During the summer months it helps to keep your home cool and during the winter months it will help with keeping your home warm and so lowering your fuel bill. Never leave things like wet clothes in the washing machine. The idea here is that everything wet needs to be dried out as fast as possible. Wipe the walls after a shower, identify any source of humidity in your home and dry that off too. The faster you do that, the better the results can be. Your home needs a lot of ventilation. That’s why you need to opt for a humidistat fan in your bathroom, as it’s a unit that helps you maintain the right humidity levels in your bathroom. You can also open up the doors and windows to help with ventilating. One of the reasons why mould grows fast is because apart from ventilating and removing spores as soon as they appear, you should allow sunlight in your home. Make sure that there are no dark areas in your home that could easily become wet and cold and so accelerate the start of mould. This way it will be easier to stop mould from ever appearing, something that can be extremely handy and important in the long term. The way you achieve that is by keeping the doors to the rooms open. Additionally you should allow some space behind all furniture, as well as keeping your wardrobes and cupboards in a state where they aren’t over full, bursting at the seams to allow air to circulate both around and within them. One thing is certain, stopping mould from growing in your home can be quite challenging. But if you take your time and use these tips, you will be more than ok. Your focus has to be on controlling the humidity levels using the tips above. Remember, you want to have a clean home, so stopping mould from growing is a priority. Use these tips, and you will have no problem preventing the apparition of mould in the long term!